Micro Collection "Bucket o' Soldiers"
Although its failure is often attributed to a flawed concept and incompatibility with the standard 33/4" line, the Micro Collection was a victim of bad timing more than anything else: released at the height of product-saturation and during the waning of the Empire Strikes Back's run at the cinema, fans weren't ready for a new toy line, regardless of its innovation or quality. Over 15 years after its release, however, with micro-scale toys a fixture of most major toy lines, the Micro Collection's influence, as well as the validity of the its designers' vision, is indisputable. These were some of the finest Star Wars toys produced by Kenner; its a shame that no one bought them. Left in the wake of the Micro Collection's rapid demise were scores of over-stock product. In particular, Kenner was left with a large amount of figures--painted and unpainted, bagged or packed for inclusion in playsets--which they were forced to find a way of liquidating. 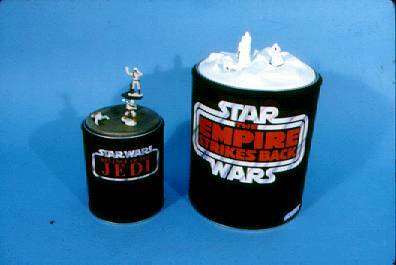 In later years, bagged Micro figures were blown out to toy dealers, given away in a See-Threepios cereal promotion, and sold through the Star Tours giftshops in Florida and California. As the included images make clear, however, an attempt was also made at marketing Micro Collection figures using new concepts and play scenarios. In particular, this "Bucket o' Soldiers" concept places an emphasis on the figures as toy soldier-like collectibles, independent of the modular playsets on which the Micro Collection was based. 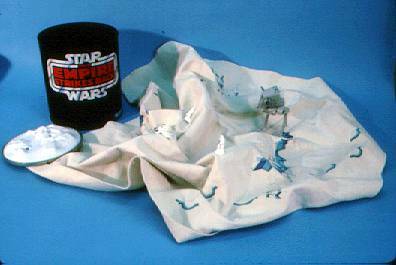 As you can see, the figures would have come packed in buckets (one shows an Empire Strikes Back logo, the other the Revenge of the Jedi monniker), along with play mats meant to reflect the snowy terrain of the ice planet, Hoth. For whatever reason, these Micro Collection "Buckets o' Soldiers" were never produced, leaving them among the great many Micro Collection toys which were concepted or prototyped, yet, ultimately, thrown on the scrap heap.